Last week both Uber Freight and Convoy released new data-driven products meant to help shippers understand trends in freight markets. The competition between the two large digital brokerages appears to be heating up and is driving a new wave of technological innovation, creating more transparency and smoothing out information asymmetries. 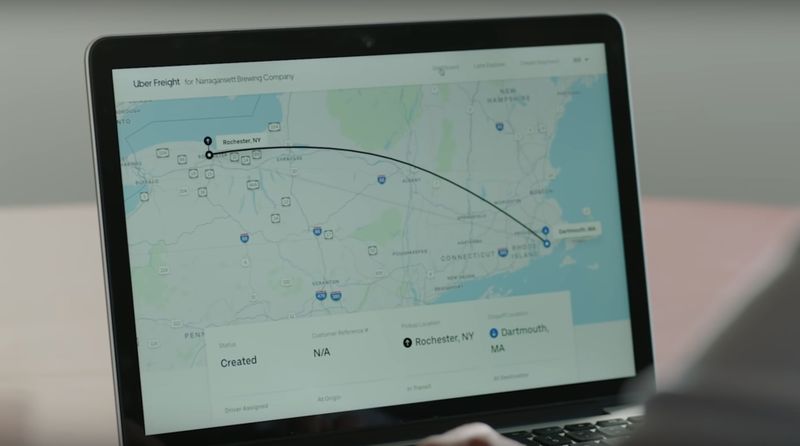 On Thursday, Uber Freight released a new shipper-oriented feature to the public: Lane Explorer, which gives shippers guaranteed market rate-based quotes for dry van truckloads up to fourteen days in advance. Shippers can then choose which day is the optimal day to tender their shipments, and even if they wait a few days to build the load, the rates stay valid. Uber Freight is betting that its algorithms can forecast prices for every origin/destination pair in the country two weeks in advance and offer shippers competitive rates and still make a margin. In our view, Uber Freight’s Lane Explorer represents a significant advance in price discovery, predictive analytics, and freight market transparency for the transportation and logistics industry. FreightWaves spoke to Stefan Sohlstrom, Product Manager at Uber Freight. Sohlstrom said that while Lane Explorer generates quotes for lanes between any two zip codes in the lower 48 states, the granularity of Uber Freight’s supply and demand data is actually on a lat-long level. We wanted to know how Uber Freight mitigated the risk of runaway spot market volatility. “We’re making a probabilistic bet that we can find you a truck for this [price]. The optimization running is truck cost prediction—that’s what it’s improving upon every day. We’re trying to understand the likelihood of a truck picking up a load for a certain rate on a certain day in a certain place,” Sohlstrom said. The very same day, November 29, Convoy announced Shipper 2.0, a new wave of releases for its shipper platform that will deliver further transparency and data. So far, the new features are centered around two buckets: the market outlook, that shows shippers current and future trends by region, and the lane network, which gives shippers realtime data about changes in their most important lanes. We spoke to Convoy’s Chief Product Officer Ziad Ismail about Shipper 2.0 and the strategy behind Convoy’s technology. “When we first started the company three and a half years ago, the first phase of the company was really about making it really easy for shippers to move freight, with a better experience than ever before: instant price, instant indication of covering or not, and tracking,” Ismail said. “There’s a very deep set of optimizations you can do if you’re a shipper,” Ismail said, listing key performance indicators like tender acceptance, service levels, and on-time rates. In our view, what’s most interesting about Convoy’s strategy is that where the conventional wisdom seems to be that technology is commodifying trucking capacity—and therefore shippers are more willing to use brokerage services to source capacity—Convoy actually wants to provide enough data and visibility into the supply chain to differentiate itself. In other words, Convoy wants to use data to demonstrate its superior performance relative to other carriers and logistics services in a shipper’s routing guide, confident that the enhanced visibility will allow shippers to make objective comparisons of service providers and drive more freight onto Convoy’s platform. Ismail emphasized that Convoy provided its customers with qualitative commentary in addition to data. “A forecast that is just numbers is hard to act on. Our internal teams are trying to connect those data points and say ‘here is where our model is going, qualitatively, here are the likely drivers.’ We find the combination [of quantitative and qualitative] really resonates with our customers. If we can’t explain why it’s happening, it’s interesting but not useful,” Ismail said.